This recipe may sound like an odd juxtaposition. I have to admit that it is a recipe of desperation. I was looking for a very quick recipe to cook on weeknights. We were shopping Costco one weekend, and if you have ever been to Costco on a weekend, that means....SAMPLES! 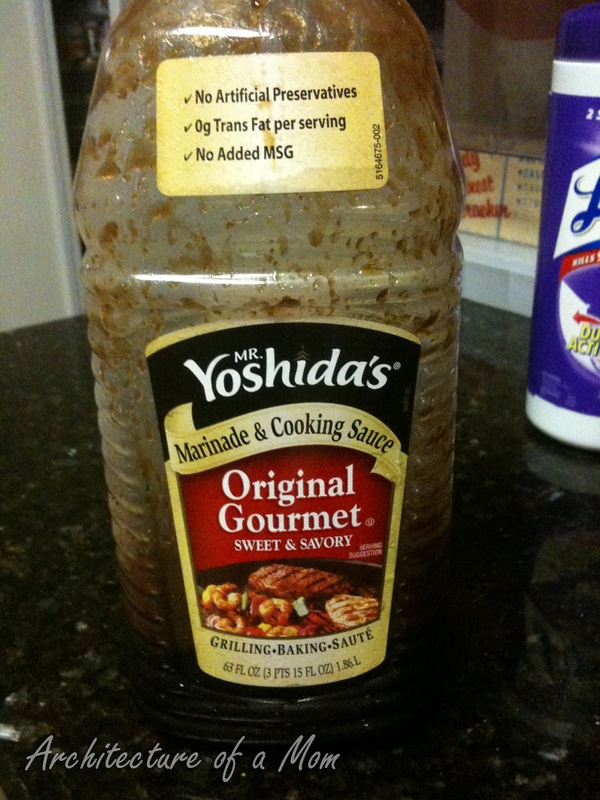 We tried a sample where a little old lady was sauteing some sausage in a soy based sauce: Mr. Yoshida's. My husband loved it and we bought this very large bottle. That little sample was the basis of this recipe. It is super simple. 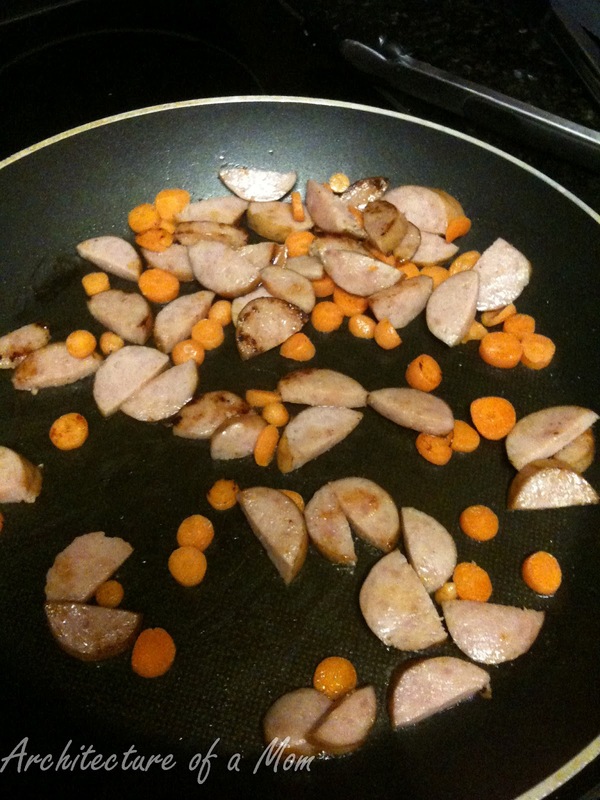 Basically, you take a link of precooked sausage (such as keilbasa). You cut up your vegetable of choice (usually carrots or broccoli in my house). Meanwhile, preheat a non-stick skillet over medium high heat. Spray some cooking spray in the pan. Saute the meat and vegetable until lightly browned. If you are cooking for a picky kid--you know, one like my four-year-old who doesn't believe in sauce if it isn't ketchup--take their portion out of the pan now. 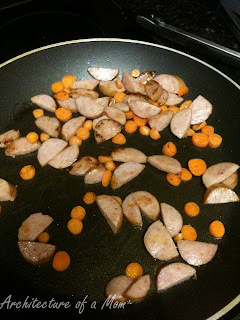 Then pour about 1/2 cup of the sauce and a little water into the pan and mix it with the remaining sausage and vegetable mixture. Reduce. Add red pepper flakes to taste. 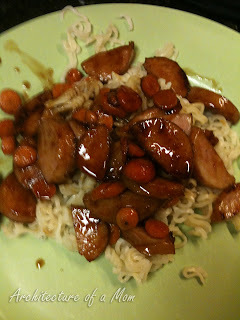 Serve over noodles or rice. 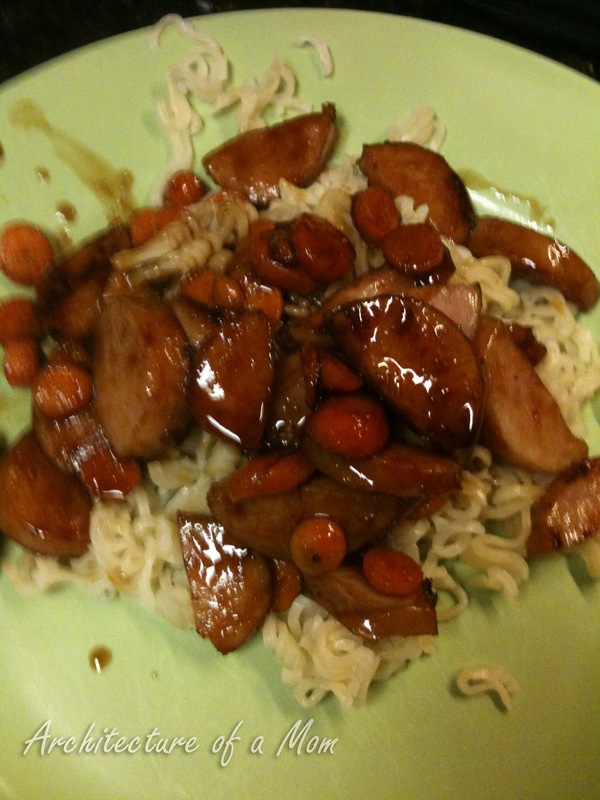 This is a quick, easy and cheap meal we all love! Hope you do too! Sometimes I link up at the following places: 413 Sparrow Lane, 504 Main, A Little Tipsy, Blessed with Grace, Crafty Scrappy Happy, Eat at Home, Finding Fabulous, Gingersnap Crafts, House of Hepworths, How to Nest for Less, MomTrends, Not Just a Housewife, Organizing Junkie, Positively Splendid, Simply Sugar and Gluten Free, Six Sisters Stuff, Sugarbee Crafts, Tidy Mom, The Finer Things and I Dream of Clean’s Spring Cleaning Challenge, The King's Court IV, and The Finer Things in Life. I like unusual combos like this. Thanks for sharing the recipe!